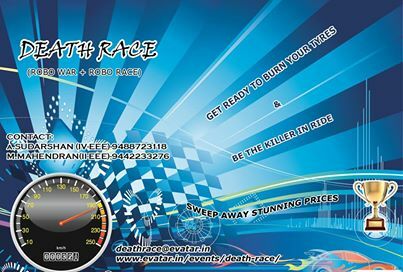 We invite all the robotic hobbyist to be a part of our death race event. To step-up the spirit of engineering, step down ignorance and enhance quality of Engineers..
To provide a platform to innovate, experiment and exhibit ideas…. polymorphism: Has both technical and fun events. Offers a plethora of knowledge and loads of attractive prizes. Starter for the young minds and gives a higher power output at good power factor. There are some features can be explained but for everything else has to be experienced. Come join hands with us in the never ending path to sun shine. Technical Events Registration : The Technical events need online registration prior to the competition. Go through the following links of the various events.